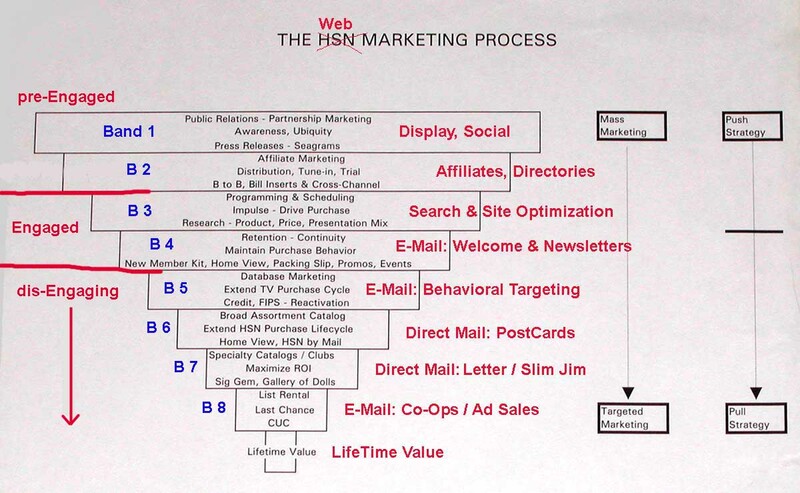 What we have here is a chart of the optimized interactive Marketing Bands system we developed at HSN, with an overlay of comparable online Tactics in red (Band numbers in Blue). After nearly a decade of testing, we arrived at the place where each dollar of marketing spend – at each level – yielded the highest profitability to the company. Many of the examples here pertain directly to web marketing, and I promise I’ll be specific on that. Band 1: Public Relations / Partnership Marketing – at the widest end of the funnel, we tried all kinds of Mass Advertising – TV, radio, newspaper, TV Guide(s), all of it. Even tried different combinations of media using geographically controlled test groups / media mix models. None of it worked. Core realization: We are interactive TV. We can’t buy mass media that is more powerful than we are when we do a great job with selecting products and presenting them properly. The power of the click – in this case, people channel surfing with the remote control – is how we generate Awareness (Attention / Interest in the AIDAS model) with potential buyers. Interactivity itself is the power. Optimized Result: Use the power of our TV and customer base to gain access to broad audiences through no cost / low cost Marketing Partnerships where HSN is featured. 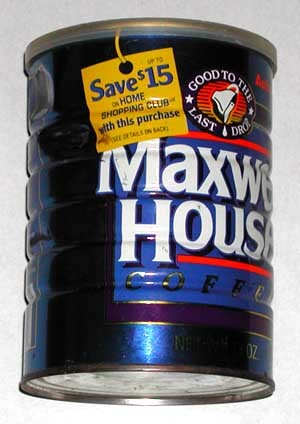 Example: Maxwell House cross-promotion, coupons on coffee cans. BTW, Maxwell House was absolutely thrilled with the unit volume they blew though on this promo. There were field reports of stock-outs in some areas :O This intense activity was primarily driven by current customers, of course. You could say they were, um, Engaged by this offer, to say the least! Web analog: Offline advertising has never worked particularly well for online properties with the possible exception of local media for new launches. Use the power of interactivity itself to get the word out – focus on the product and the customer experience. If you can get press / stimulate Social at very low costs, great. Try to form partnerships with targeted packaged goods companies; this may be difficult if you cannot offer “media” in exchange – high traffic. Band 2: Affiliate Marketing – the necessary evil of distribution in the HSN case. We paid commissions to cable systems based on sales from the zip codes they served. There were also levels of extortion beyond that insisted on by some cable systems: forcing us to pay for “marketing” consisting of buying the cable system’s own media – TV spots, guide ads, statement stuffers, etc. Core Realization: We found through analysis that literally, the closer our channel was on the cable system to the “high traffic” areas of network (broadcast) television channels, the higher the revenue per household was. For example, if ABC was on Channel 4 and CBS was on Channel 6, HSN on Channel 5 would generate max revenue per household for the cable system. It was that simple; closer adjacency to the most popular programming meant we got more “click traffic” from channel surfing. This is pretty much identical to an SEO effort, where you are simply getting more exposure for your content during “seek” behavior (search on the web, channel flipping for TV). None of the cable system marketing resources we bought made a difference in any combination using controlled tests. Optimized Result: Killed as much of the system marketing as we could and used the money to pay higher affiliate fees for these premium channel positions near network TV channels. Web analog: Traditional media approaches to affiliates need to be carefully scrutinized and tested through; look for environmental effects that affect performance (on the web, that they get SEO). “Quality” in the affiliate world is everything. Some affiliates will want to play ball and others will not. There will be “super-affiliates” who really get it, and those affiliates should be supported in any way possible. Don’t overspend on affiliates that don’t get it. We’ll continue on down through the bands in the next few posts. Any questions on the approaches / testing / decisions above? Can you expand a little on your statement “none of the mass advertising worked”? i.e what criteria did you use to conclude that? 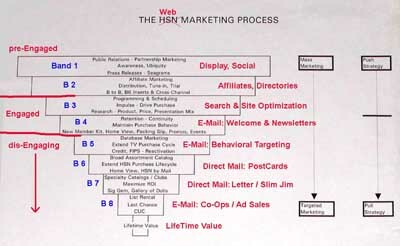 Thinking back to how I first became aware of the shopping channel, I do believe it was more of a channel surf than any mass advertising so I would agree with your conclusion and web analog advice. Would it be safe to say that a simple way to make band 1 decisions is by asking customers how they became aware of you and then decide from there. 1. Find two similar cable systems, or DMA’s, based on demos, penetration, channel position, etc. 7. Is this Contribution higher or lower than media spend to generate it? 9. Now with these many cases, is Contribution higher or lower than media spend for any scenario? Interactivity is different; Pull outperforms Push. INline approach (Band 3) far superior; reallocate media spend to analysis and improvement of “user interface”; the TV show is the “Landing Page” for all these channel surfer / clickers and should be Optimized for all the traffic we already get! Whatever free media we can get, fine, can’t hurt (promotions, PR).